Celebrate Earth Day for just one day? Not at Discount School Supply! Discount School Supply encourages little learners to explore and appreciate their environment every day. But in honor of Earth Day, Discount School Supply is offering 30% OFF on select items for the next 5 days! Science Activity Magnifiers - Set of 12 for ONLY $11.19! 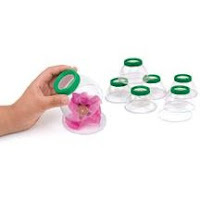 Bring the wonders of the Earth up close with these green and clear plastic magnifiers. Garden Creature Puzzles - Set of 8 for ONLY $27.26! Challenge advanced puzzlers with this vivid set of 8 lovable garden critters. The Butterfly Pavilion for ONLY $20.06! The see-through mesh with zippered entry on this pavilion allows easy access for care and feeding and keeps butterflies inside until you set them free. Find more Earth Day deals when you click here. Our eco-minded sale products are all about learning, getting active, celebrating our planet and appreciating our environment. Think green and save green too with an extra 30% OFF until Monday! Shop Discount School Supply today! Teachers, moms, dads and caregivers: save more on quality items with the Earth Day 30% OFF Sale then be sure to check back with Discount School Supply for other great bargains on early childhood learning essentials like Arts and Crafts, Active Play items, Dramatic Play products, Manipulatives, Furniture, Curriculum Resources and more. Savings with a Dramatic Effect! Drool-Worthy Deals for Infants & Toddlers! A Scientific Method to SAVINGS! Do the Math: Discount School Supply = SAVINGS! 2¢ Shipping Sale On Now!